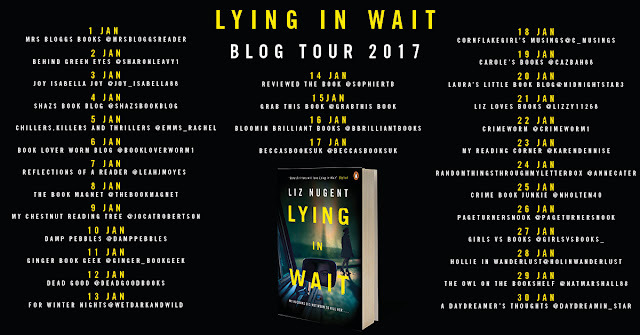 I am delighted that my first blog tour of 2017 is for the fabulous Lying in Wait by Liz Nugent. 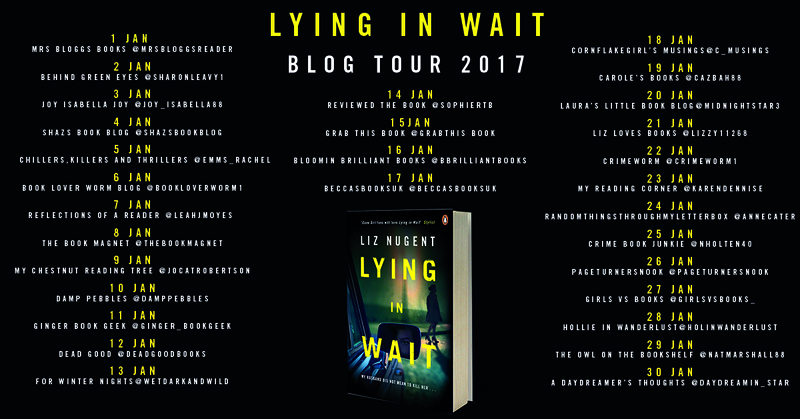 I was very lucky to get the opportunity to ask Liz Nugent some questions and I'm sure you'll find her answers as entertaining as I did. Firstly I'm sharing my review so you get a feel for what the book is about and the reason for some of my questions. Happy reading! 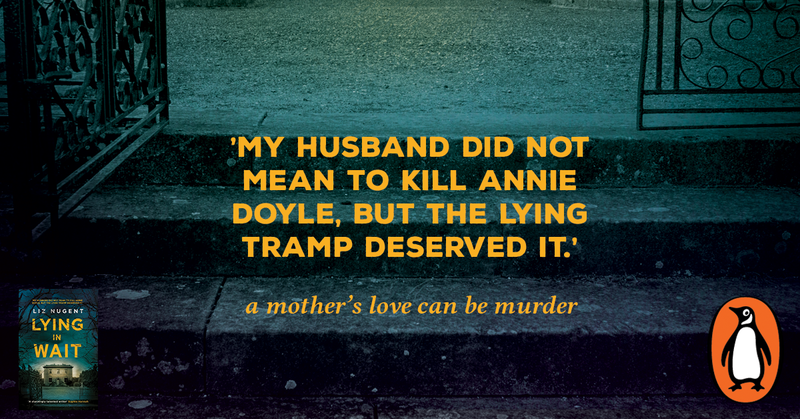 This is a dark, twisty and utterly gripping domestic noir that you won't be able to put down from the author hailed as Ireland's answer to Gillian Flynn. I had little doubt from this most excellent first sentence, that this book was going to be slightly on the dark side, but I could never have guessed how deliciously dark it was going to be. Talk about a dysfunctional family - Lydia reminded me of the fabulous Bette Davis in one of my favourite films, The Anniversary. A cruel and clever matriarch ruling her family without them even realising they are being ruled. Tremendous! Andrew and Lydia Fitzsimons are doing very well for themselves. They live in a huge house with their son, Laurence, but beneath the perfect facade lies THE most dysfunctional family I have ever read about. Lydia is absolutely crazy as a coconut and Andrew and Laurence do everything they can to please her. Just how far they go on behalf of Lydia is enough to make your hair curl, and does she appreciate it? Not one little bit. When Andrew kills Annie Doyle, Annie's family register her as a missing person and her sister, Karen, never gives up hope of finding out what happened to Annie. Annie was estranged from her family so when she sends mysterious letters reassuring her family that she's ok, they breathe a sigh of relief. Wait a moment, wasn't she killed in the first sentence? Aha! I told you this book was dark. There is so much I could say about this book but I fear I may spoil some of the story if I continue, needless to say a brilliant opening line deserves an outstanding ending and Liz Nugent doesn't fail to deliver. I have read so many fabulous reviews of Liz Nugent's debut, Unravelling Oliver, but I have not yet had the chance to read it; if it's half as good as Lying in Wait, it will be money well spent. Lying in Wait is a deliciously dark and constantly surprising story. Never has the well used line 'hooked from the start' fitted so well; you can't fail to be hooked from the start with this one and Liz Nugent definitely reeled me in. A fabulous book - I loved it. Now for my Q&A with Liz Nugent. Q: What inspired you to write Lying in Wait? A: A man once told me that he strongly suspected his father had murdered a prostitute in the 1960s. He had no evidence or no way of proving it. He never had the courage to challenge his father and went to his grave wondering. He told me this story about 25 years ago and he is long dead now. I always wondered what it would be like to grow up in a house where you suspect your father is a murderer. Q: Lying in Wait has an amazing first line. Did you come up with that first and build the story around it or did you think of it as the story went on? A: Originally, in the first draft, Laurence was the main character and the first line was ‘We were all liars in my family but Mammy was the best liar of all of us’. Then in the second draft when I had decided that Lydia was the main character, the first line was ‘Technically, it was manslaughter’ but it didn’t tell the reader enough about the character so I cut that first line and made the second line the first line ‘My husband did not mean to kill Annie Doyle, but the lying tramp deserved it.’ This way, the reader knows exactly what kind of person they are dealing with. Q: As reviews often show that readers were 'hooked from the start', how important do you think first lines are? A: I like to grab the reader from the get-go and I like to write first person narratives so that the reader is automatically in the head of the character. The first line should set the tone for the book and let the reader know immediately what kind of book they are reading. I’ve only written two books and the first lines of each are so often quoted that I have quite a challenge ahead of me now for how to start book 3! 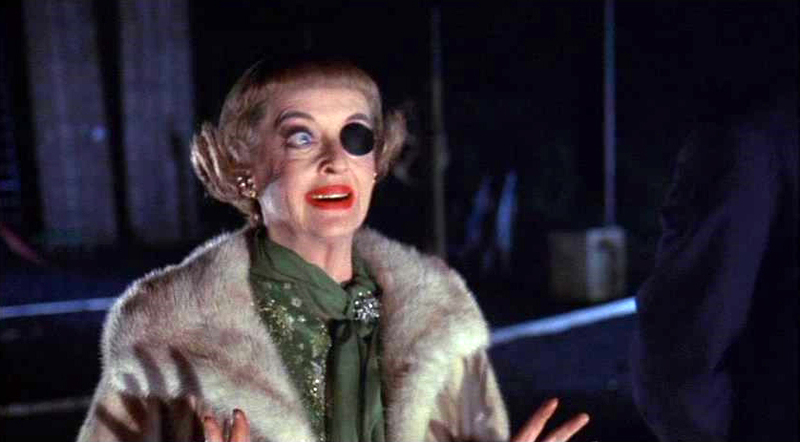 Q: I had a mental picture of the fabulous Bette Davis as Lydia whilst reading Lying in Wait. 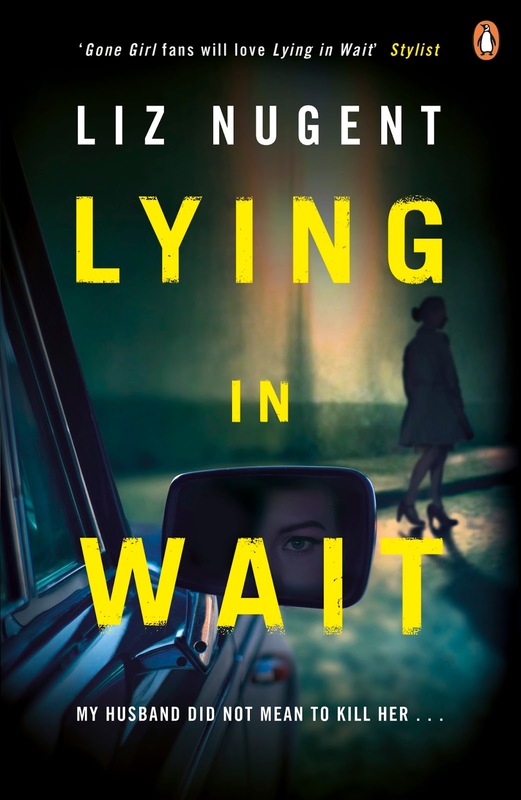 If Lying in Wait is made into a film who would you like to see playing Lydia? A: That’s a great suggestion! I think it does have that film noir feel about it. If they were to cast an Irish actress, I would suggest Cathy Belton who can do charm and menace equally well, but if we’re talking international, I think Julianne Moore would be great. Q: If you only had one chance to sell Lying in Wait, what would you say to encourage people to read it? A: The strap line on the front cover is designed exactly for that purpose and my editor and I came up with lots of suggestions but in the end they went with the opening line which I hope is a good selling point! Q: Lying in Wait is often very dark; how does the mood of your book affect you when you're writing? A: It really doesn’t at all. As soon as I close the laptop, I am back to my humdrum suburban life and my mood is completely unaffected. My friends are so surprised that I write such sinister stories because in real life, I am fairly light-hearted and up for a laugh. A: Inhabiting another character’s head for a while can be very liberating particularly when they are really despicable. You get to say things you wouldn’t dream of even thinking! Q: When you're not writing, what do you enjoy doing? A: I love going to the theatre and I love tv drama series. I just inhaled Peaky Blinders and I’m catching up on Line of Duty. So, so good. Q: I haven't yet had the pleasure of reading Unravelling Oliver but which book did you enjoy writing the most and why? A: That’s like asking me to choose between my children! But I have to admit that writing isn’t always enjoyable. It is work and like any job, you can have good days and bad days. I wrote Unravelling Oliver over the course of about six years while I held down a fulltime job, whereas Lying in Wait was written in two years when I had no other commitments. Q: Can you tell us a little about yourself and what we can look forward to from you in the future? A: I’m 48 years old, married, no children. I live in Dublin. My background is in theatre and television production. I am number 5 of nine children. I am an atheist. I don’t like cats or coffee. I am more comfortable in jeans than dresses. I love roast chicken dinners. I read across all genres. I hate ironing but I don’t mind supermarket shopping. I am very tidy. I love sunshine and wish we got more of it in Dublin. I love France. I love going to the theatre. I’d like to live closer to the sea. I have seventeen nieces and nephews and I adore them all. Hopefully, I will keep writing books with a sinister edge though sometime in the future, I’d like to write a stage play. 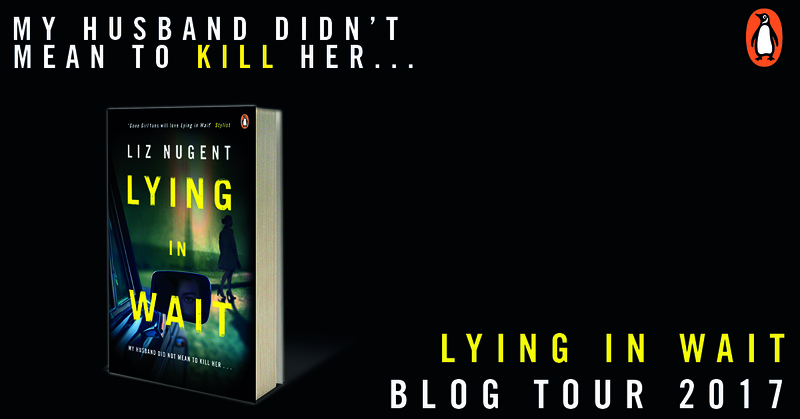 Thanks so much Michelle for the great questions and for taking part in this blog tour! Liz was born in Dublin in 1967, where she now lives. She has written successfully for soap opera, radio drama, television plays, short stories and animation for children. Liz’s first novel Unravelling Oliver was published to critical and popular acclaim in March 2014. It quickly became a firm favourite with book clubs and reader’s groups. 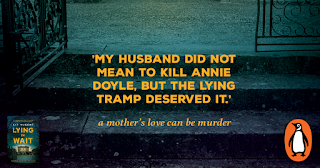 In November of that year, it went on to win the Ireland AM Crime Novel of the Year at the Bord Gais Energy Book Awards and was long listed for the International Dublin Literature Prize 2016. 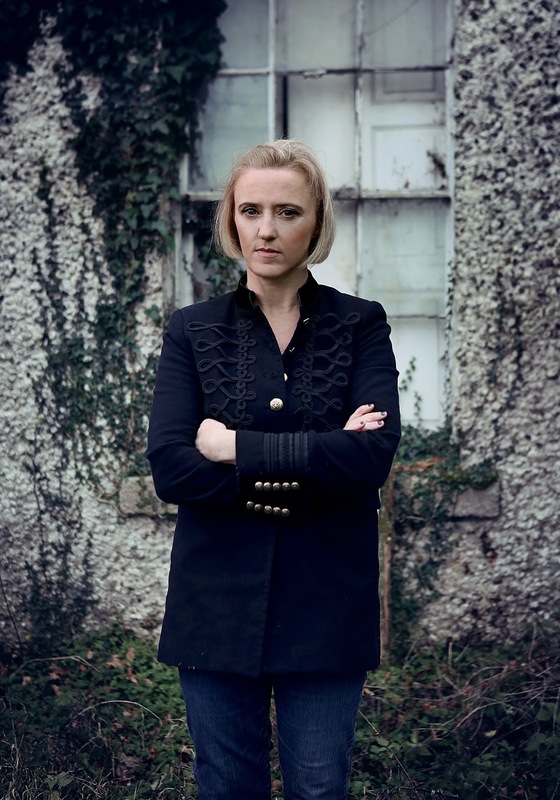 She was also the winner of the inaugural Jack Harte Bursary provided by the Irish Writers Centre and the Tyrone Guthrie Centre in Dec 2014. Her second novel, Lying in Wait, was published in July 2016 and went straight to number 1 where it remained for seven weeks. Liz won the Monaco Bursary from the Ireland Funds and was Writer in Residence at the Princess Grace Irish Library in Monaco in Sept/Oct 2016. In Nov 2016, Lying in Wait won the prestigious RTE Ryan Tubridy Listener's Choice prize at the Irish Book Awards. Aside from writing, Liz has led workshops in writing drama for broadcast, she has produced and managed literary salons and curated literary strands of Arts Festivals. She regularly does public interviews and panel discussions on all aspects of her writing.